The trial of former Maldives President Mohamed Nasheed, who faces charges of abuse of power, has been postponed in the capital, Male, after Mr Nasheed failed to attend. Mr Nasheed, who resigned in February in what he said was a coup, is accused of illegally arresting a judge. The former human rights activist denies the charges against him and says the trial is politically motivated. A conviction could disqualify him from contesting future presidential polls. Mr Nasheed has pulled off a typically flamboyant stunt, leaving the capital island on a flotilla of boats chartered by his party to go campaigning in outlying islands, reports the BBC's Charles Haviland in Male. His supporters cheered as he addressed them from a boat at a jetty in the capital. A few hundred metres away, judges and court authorities waited for 20 minutes for him to come and be tried, before postponing the hearing in the absence of the defendant. The former president told the BBC he was defying the court as he had no faith in it. "Once they started to set up a fabricated court, bring in judges who are not judges of that court, and the whole structure of it is so... politically motivated, it is very obvious it is not meant to serve justice," he said. He and his supporters plan to campaign for two weeks in their southern heartland for elections which they want immediately, but which the new government says cannot happen before July. There was no indication that the authorities were planning to intercept Mr Nasheed, our correspondent says. His supporters hail him as a reformist moderate but his critics say he overreached his powers while in office. The government denies accusations from Mr Nasheed that it is moving the Muslim nation along a track of religious radicalism. Last week, a court order was introduced preventing him from leaving Male. Mr Nasheed denounced the ban as an unfair and politically motivated attempt to prevent him from campaigning in the forthcoming elections. 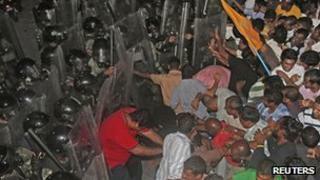 But the government argues that travel restrictions are standard ahead of several court cases Mr Nasheed faces. His party has vowed not to follow any orders from the courts until the judicial system is reformed. Mr Nasheed, who was succeeded by his deputy, Mohamed Waheed, has said he was forced to quit by threats of violence from rebellious police and soldiers. But a domestic commission of inquiry - backed by the Commonwealth - last month rejected his account, saying he had stepped down voluntarily. The charge against him relates to an incident in January, when he was accused of illegally ordering the arrest of a judge accused of corruption. Now the 45-year-old, once an Amnesty International prisoner of conscience, faces up to three years in jail or banishment to a remote islet in the popular tourist archipelago if found guilty of abuse of office. Despite the small size of this country, Mr Nasheed became a disproportionately influential head of state, raising the Maldives' profile by highlighting the threat posed to it by climate change, our correspondent says. Apart from the criminal case, Mr Nasheed also faces two court cases over accusations of defamation. A judge indefinitely postponed the first case on Sunday at the request of one of the plaintiffs, while the second case is due to be heard on Tuesday.